As many of you know, I have been doing a course on learning centers. 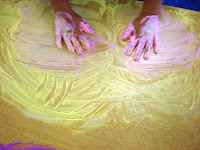 Ms. Cornwell, the author, stated the importance of a fingerpaint center, all the wonders it does for children. So, today I had a fingerpaint center....poor Mrs. T.
Ms. Cornwell emphasized the importance of learning to clean up afterwards also, but since this was our first time, we tried, but I think we are going to have to work on that aspect. I used shaving cream with dried watercoloring. Ms. Cornwell suggested using dried tempera whenever you would like to color something as it doesn't stain the tables. I figured the dried watercolors would do the same thing. 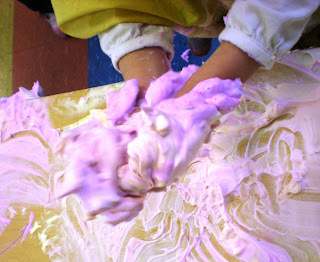 So each child got a pile of shaving cream, then sprinkled on some color, plus they all had smocks on(thank goodness). Then came the fun part, the mess, beautiful colors swirled around, mixed with friends colors, so much fun. Okay now what? Clean up. 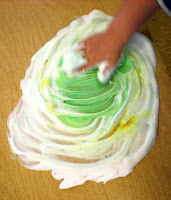 We had shaving cream in our hair, on our clothes--even with smocks, on the floor, smocks covered front and back. I wasn't sure how to clean up the kids and also let them clean up the area. We tried with some paper towels and wash rags, but I think this will be a skill learned with practice. Was it fun? You bet, the children loved it, they couldn't wait for their turn. Oh, and the dried watercolor? It didn't stain the table, but ask the parents how their children turned colors. Oops. I think Mrs. T will be cleaning shaving cream up for weeks. We've done this same activity in the bathtub! My boys love to cover the walls with colored shaving cream. Fun! Fun! Oh my goodness! What fun! I'm hiding this post from my girls, because I am way too tired at the moment to play in and clean up shaving cream. A definite fun activity for later. Even though they are getting older, I think they would absolutely love it! Have the kids painted with pudding? I've heard of this as well. So fun! I am so glad that you are sharing what you are learning from your coure work. I'm enjoying learning along with you! Your site has been picked for our ABC Jesus Loves Me Preschool Excellence Award! Congratulations! Go to http://www.abcjesuslovesme.com/index.php?view=article&catid=85%15Afavorite-web-links&id=341%25links&option=com_content to accept your award!!! The best way to clean up shaving cream? Dry paper towels--drag the shaving cream off of the table into the garbage can/bag, then use more dry towel to wipe the rest. Hint: the more you wipe or rub, the longer it lasts, so minimize your contact with it. 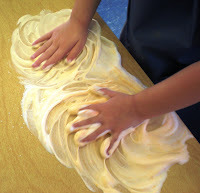 Whenever you use shaving cream or bubble solution (or anything soapy) on tables, a spray bottle of vinegar after the kids clear out is a great way to get the soapy film off of the table. :) Or...you could always let the kiddos use your art squeegees and pull/push the shaving cream off the table into the garbage can for you. Try liquid watercolor, if you have it available. You can always add more, so start with a small amount. We love shaving cream in my class. For cleanup I give the kids plastic scrapers to scrap it into a bucket that we rinse in the sink. The kids wash up in the sink and we use towels (fabric, not paper) to get the residue off the tables. Hi, I am very glad you enjoy reading the blog. All I can say to novice bloggers is to keep blogging and also keep visiting and commenting on sites that are like yours--where like readers may be. Good luck.